If you are like me, then you probably have a series of alarm clocks going off in the morning to try to wake you up. 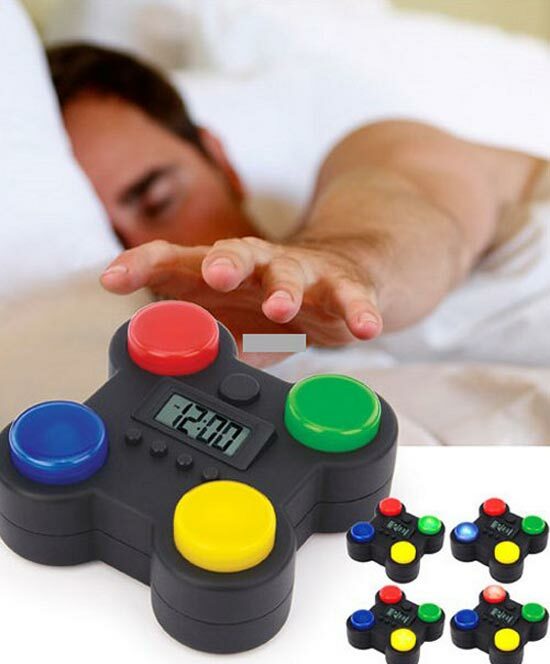 I think I could sleep through just about anything, except maybe this Simon Says memory game alarm clock which certainly looks like it would wake you up. As soon as the alarm goes off, you have to follow the sequence of lights to shut it up, if you don’t get the correct sequence by pressing the correct buttons the alarm will continue to sound. Luckily it is battery operated o it should be pretty easy to throw it across the room to shut it up, as I cant imagine myself being able to get the correct sequence to turn off the alarm as I am not the most alert in the mornings. If you want of of these colourful and annoying looking alarm clocks, they will be available shortly from Urban Trend, no word on pricing as yet.